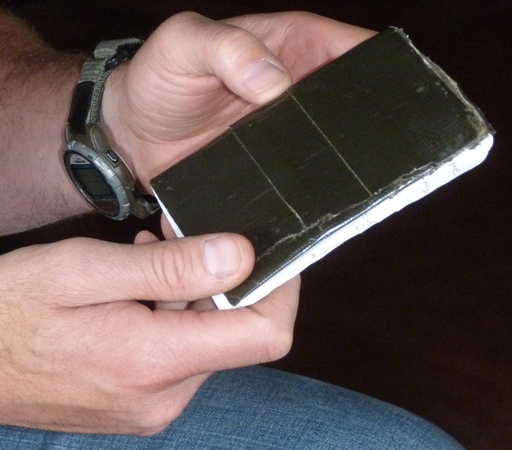 These days, John Dale Gardner has to search hard for the little notebook covered in brown duct tape. It’s small—five inches by four inches—and filled with Gardner’s handwritten notes. And despite its protective duct tape cover, it gives the appearance of having been through a lot. The stitching on the pages is stretched, sending the lined leaves slightly askew and the duct tape edges are worn like ancient leather. Appearances don’t lie. The book looks like it has been through combat because it has. During the seven months that Gardner was in combat in Iraq, the book was his lifeline, remaining in his pocket at all times. Back home in the quite peacefulness of Virginia’s Shenandoah Valley, it is sometimes easy to forget that a world away there are Americans serving their country and in harm’s way day in and day out. As civilians go about their daily lives—off to school, work and family gatherings—those service men and women face a constant barrage of non-stop challenges to their very existence. They grieve for fallen comrades one moment and go back on patrol the next. Physically it can be exhausting. Mentally it can be overwhelming. He never set out to write a book. All he wanted to do after high school graduation was become a diesel truck mechanic and join the Marine Corps. By the age of 21, he had completed his training at Nashville Auto Diesel College and had been hired by a local trucking firm. He had also joined the Marine Corps as a reservist out of Lynchburg, Virginia. Being a part of the elite United States Marine Corps was something he had always wanted to do and he signed up for six years. His basic training was at Parris Island in South Carolina and he had additional desert warfare training in California. Officially he was a motor transport operator and a combat engineer. Although he had seen a little overseas duty in Albania, the first five years of his hitch with the Corps were fairly low key. Gardner even found time to get married. He and Heather were the proud parents of a little boy. His son was nearly a year old and had recently taken his first steps when John Dale got word that his unit was deploying to Iraq. For the Marine corporal, squad leader and member of 2nd Platoon, Charlie Company, 4th Combat Engineer Battalion, the next seven months changed his life forever. It was August 2004 in Afghanistan’s Al-Anbar province. Insurgent activity was at its peak and the cities along the Euphrates River where John Dale’s platoon spent most of its time were highways for insurgent activity and the Marines had to follow the highways. They came to intimately know the cities of Haditha, Barwana and Hit, as well as the surrounding villages. “We were a combat engineer unit, responsible for providing support for the infantry. We went in front of the tanks to clear everything. We would use explosives if needed so that the main task force could come in and do their job. We had a couple of missions every day,” he remembered. Most of Charlie Company’s operations were conducted in cities by small groups of marines. Twenty or twenty-five of the men would go out on a mission at one time. They would set up in a house, engage the enemy and then move on, he explained. Wars in the history books are a series of massive battles involving hundreds and thousands of men in titanic clashes. Modern wars, like those in Iraq, are far different creatures. There is no down time in such warfare. In addition to regular missions there is always indirect danger from mortars, rockets, land mines and IEDs. “The insurgents don’t stand and fight. They are very efficient in the way they fight. You are on constant alert and always thinking about it and looking for it,” he said. The body is an amazing machine and quickly adjusts to stress. Soon the state of “ready alert” becomes a job. But, notes John Dale, being constantly on the alert wears you out, both physically and mentally. Mentally emotions must be suppressed or re-channeled, doubts must be grappled with and demons must be tamed. Thoughts of home were sometimes the hardest. Back in Churchville, little Dale was learning to walk and talk without his father and Heather found herself in charge of the construction of the couple’s beautiful log home—something John Dale had planned to oversee. From his first days in that land of heat, sand and dust, however, Gardner had found comfort in the Bible. As he turned the pages in his Bible, he jotted down verses in the small brown notebook—verses he felt could be applied to situations he and his men were facing. The notebook helped him cope with a crazy, 100-mile-an-hour world where life and death hung on split-second decisions and end results often made no sense. The combat had no beginning and no end. “I felt the need to write those verses down. I don’t know why I did it, but I wrote them down from the very beginning. It was, if for no other reason, than … I had a quick reference if I was thinking about a particular passage. I just did it for myself and a couple of friends,” he said of the brown notebook and a slightly larger khaki green one at the base that he transferred his notes to when he came back from being in the field. By reading and re-reading the passages, he felt his worries began to ease and found comfort in the verses and what God was trying to tell him. One passage John Dale wrote down in his notebook came from Jeremiah. But blessed is the man who trusts in the Lord and has made the Lord their hope and confidence. They are like trees planted along a riverbank, with roots that reach deep into the water. Such trees are not bothered by the heat or worried by long months of drought. Their leaves stay green and they never stop producing fruit. To John Dale and his friend, Sergeant Jesse Strong, this verse reminded them of the Iraqi landscape where large trees and thick vegetation thrived along the rivers. Just a short distance away from the water, however, the scorched desert replaced the lush groves. But to the comrades in arms, this passage had a deeper meaning—reminding them of the eternal spiritual desert to which they would travel if they did not drink from the spiritual river offered to them by the Lord. Strong was killed in action on January 26, 2005, in Al-Anbar, Iraq. He and three other men from John Dale’s platoon died on a mission when the Humvee they were riding in was hit by a rocket propelled grenade. Sheer luck kept John Dale from being on that mission. The platoon had 30 to 35 men and half would go out on mission one night and half the next. It had been his night to sleep. When his four buddies were killed, the platoon held a memorial service. The next day they went out and set up the first Iraqi elections. “The mission continued. You had to find time to grieve when you could,” John Dale said quietly. The mission he speaks of was tough. Most of the Iraqis were unfriendly and those that were friendly could not help the Americans for fear of retaliation. In March 2005, Gardner’s hitch in the Corps expired. Still in Iraq, he returned to California a short time later. The military kept the returning Iraq veterans on base for two weeks so they could decompress. They attended classes about post-traumatic stress disorder and received advice on how to return to a marriage and civilian life. “They told us that we were no longer normal. Once you have done something like that you are not a regular person anymore. It changes a lot of things about how you think about life,” he said. The return home was not easy, even with the decompression training. He found himself getting mad at little things and not being able to adequately express his emotions. “When you are there [in Iraq] doing that stuff, you accept it as a job and don’t realize how much it changes your thinking until you come back and realize how much effect it had. It takes a while to process that out of you because you spent so much time suppressing fear and emotions. When you don’t have to do that anymore then you have to relearn things,” he explained thoughtfully and slowly. Even as he adjusted to civilian life and having a family, his thoughts kept returning to the little notebook that kept him grounded spiritually during his time in Iraq. After doing a little research, he found the available devotional resources for active military personnel were scarce. Perhaps he could expand on his notebook of verses with some personal thoughts on how those passages had helped him navigate and survive his time in combat. A quiet, private person, John Dale is not wont to share his feelings with others beyond close friends and family. But, he reasoned, if he was to reach out to others with those thoughts, he could do it more easily in written form than spoken. “I had the notebook with all the verses written down. I felt like I should do something good with them. I felt like God was pushing me,” he said. And, so, Combat Devotions was published. The slim volume—just over 70 pages—is designed to be folded up and slipped into the pocket of troops’ fatigues. 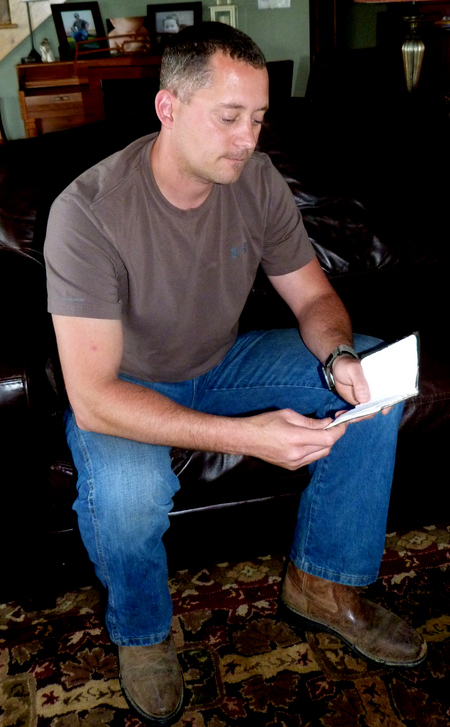 Each passage comes from John Dale’s brown notebook and includes a few paragraphs of explanation and personal connection to his combat experience. Although his first idea was to make the book available only to members of the military who found themselves in harm’s way, he realized it could be useful for anyone who works in stressful occupations like law enforcement and emergency services. There was a time when writing and publishing a book was the farthest thing from John Dale’s mind, but Combat Devotions, has turned out well, he said. His one hope is the book gets into the hands of those seeking spiritual strength in uncertain environments. “It has been different for me to put my feelings out there, but I felt I had to do it,” he said of writing the book. “I definitely had to go out of my comfort zone. My wife encouraged me, but I don’t know if even she thought that I would go all the way through with it,” he said with a smile. More than eight years after returning from Iraq, John Dale remains deeply affected by his experiences on the battlefield. Talking about those experiences still isn’t easy, though.